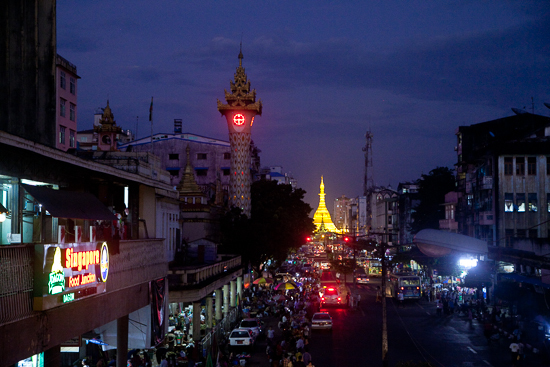 Sule Pagoda is the golden glowering heart of downtown Yangon (Rangoon). Nestled in the middle of two of Yangon’s main traffic arteries, which meet up in a roundabout that encircles around it, the pagoda is just one stupa and a stunning key city landmark. 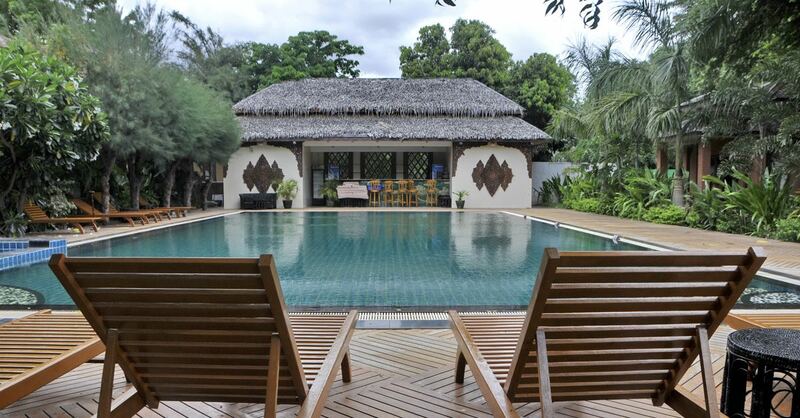 A great golden landmark for downtown Yangon. The pagoda is said to house a hair of the Buddha given to Burmese brothers by the Buddha himself; the original pagoda site is thought to date back around 2,500 years, though it has been demolished and rebuilt many times since. Tributes to and statues of nats are inside — you can recognise them by a headband scarf, next to Buddha images. 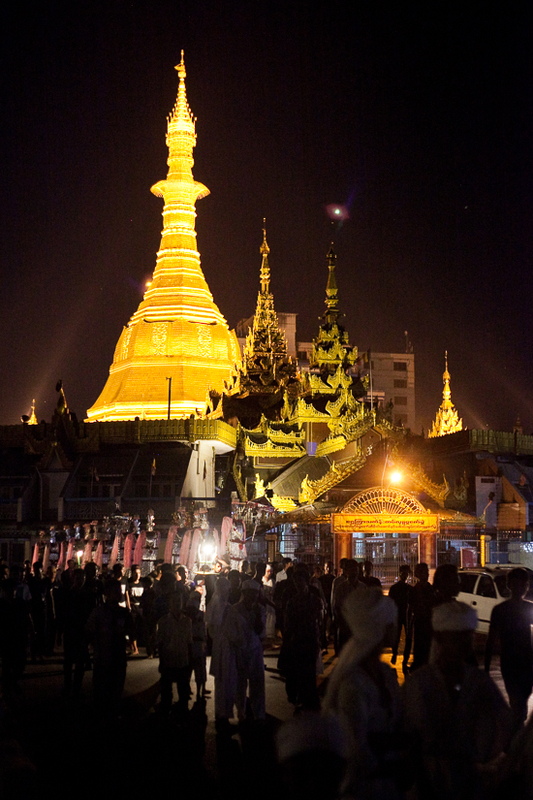 In recent history, Sule Pagoda has served as a rally point for political demonstrations, the most prominent being the 1988 uprising and the Saffron revolution in 2007. 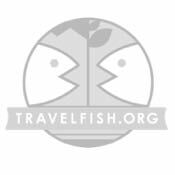 Foreigners pay a US$2 entrance fee, which if you’re on a tight budget is not really worth it, as the interior is very small and not as impressive as other pagodas. The surrounding traffic can be hectic and dangerous to cross unless you use one of the walkways, which can be a great vantage point to perch and watch the people of the city go about their daily lives. Sule is one of several landmarks in an amazing collection that sits near the roundabout. Viewed from the street or a bridge, especially during sunset, it is a spectacular site: City Hall, Independence Monument, and the former colonial Supreme Court building dictate a stop for any historically curious traveller. The surrounding religious buildings such as Jameh Mosque and Emmanuel Baptist Church stand as a testament to Yangon’s diverse communities and preserved heritage buildings. If you are looking for a better city view to capture a good photograph, the bridge next to Traders or the Sky Bar at the top of Sakura Tower can be excellent. For a view including the hustle and bustle of the street, go to Shwedagon Paya Road bridge, where the downtown evening market floods into Mahabandoola Street in the foreground. 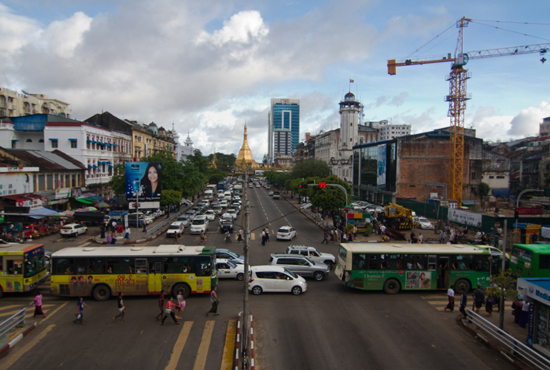 Yangon’s traffic life circles around. This area can also be a great place to stop by for food. Street venders hock dinner by the bowlfuls and good fortune in the form of birds and donations. A downtown evening market that occupies the small streets that run parallel to Shwedagon Paya Road is only a block away, so you can combine a visit for a satisfying and tiring evening walk. Or fight for a seat in one of the busy teashops that serves breakfast noodles and heavy milk tea across the street from the waking pagoda.